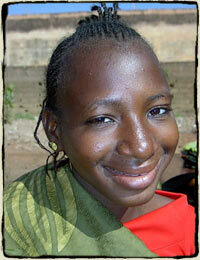 Assa, approximately 13, is of Bamanan descent. She comes from a village 200 km from the capital where her mother lives with three older brothers, one younger brother and a younger sister. Her father died in 2003. During the dry season, Assa and her blind Uncle would travel to the city to beg. They would sleep on the streets wherever they dropped at night, having earned perhaps a $1 on good days. On Fridays they would stay in front of the Mosque in the hopes of receiving handouts from the faithful. At the end of the 9 months of dry season, theoretically, the money they earned would be used to buy rice, onions and beans and some clothing to take back to the village. Assa tells us there would be days when they would not eat at all. She has never been to school. Assa was the last of the first 10 girls to join the center. She had only a t-shirt and a tattered rag around her waist, no under clothes and no shoes. She is a willing helper in all the activities of the center and will join a team of three others to start their own business, making and selling products to Hèrè jè Center.